Happy Easter everyone! We had so much fun this weekend – dying eggs, hunting for Easter eggs, decorating Easter cookies and making a BUNNY CAKE! 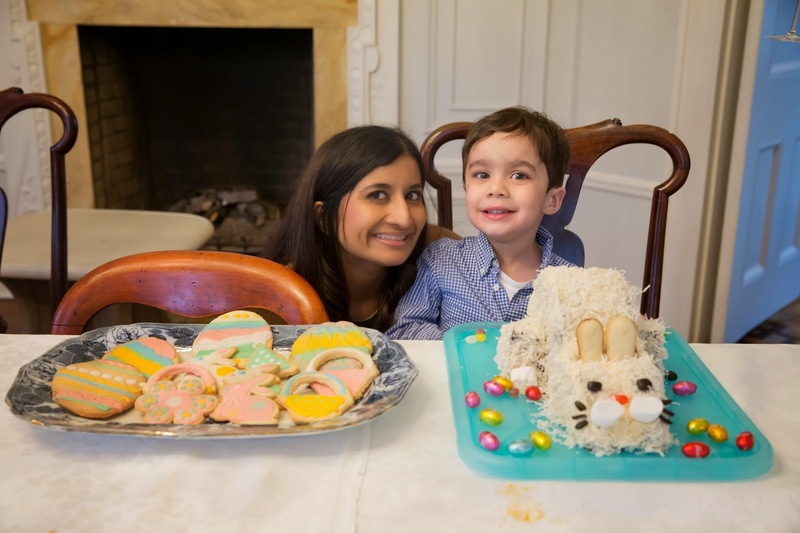 On Saturday, Dylan with the assistance of his mommy, Shruthi, and aunties decorated Easter eggs for the first time. 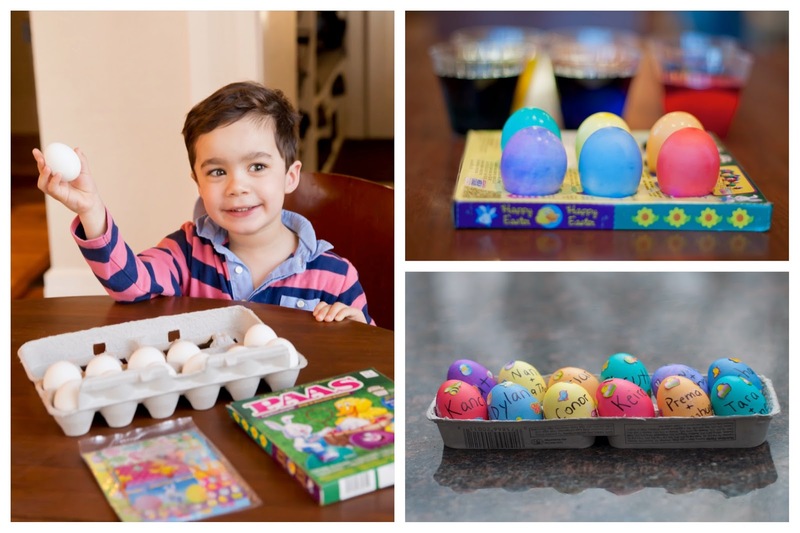 This three-year-old was super excited to carefully dip the eggs into the colored water and decorate them with adorable stickers. We helped him write the names of our family on them. 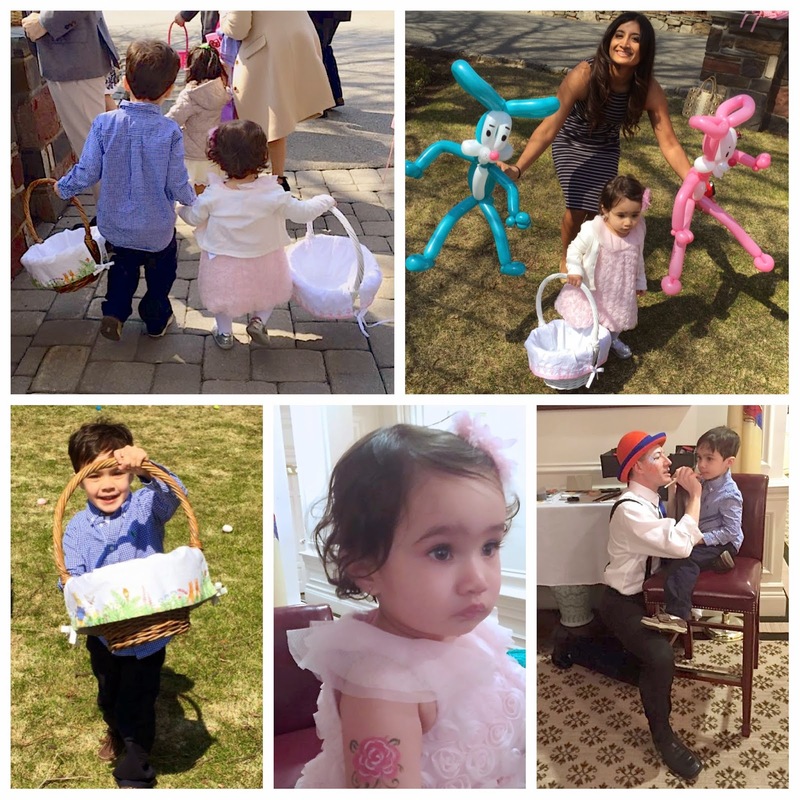 Easter Sunday started with an egg hunt for Dylan and his baby sister, Keira. They were both eager to grab as many eggs as possible and put them into their Pottery Barn easter baskets. They met the Easter bunny, had their face (and arm) painted and got their own pink and blue balloon bunnies. It was such a fun afternoon! 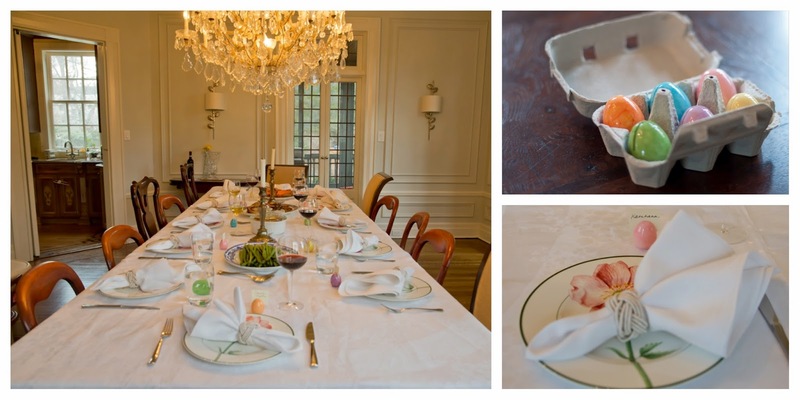 Our sister created her beautiful dinner table using floral plates from Villeroy and Bach, elegant white linens, white Williams Sonoma napkin rings and Williams Sonoma’s adorable egg shaped placecard holders. Our brother-in-law, Brian, is quite the chef and every year, we look forward to his delicious holiday meals. This Easter, we enjoyed a slow roasted leg of lamb, roasted asparagus, sweet potatoes and fingerling potatoes. For dessert, Pastry Chef Dylan helped us create sugar cookies and a bunny cake. 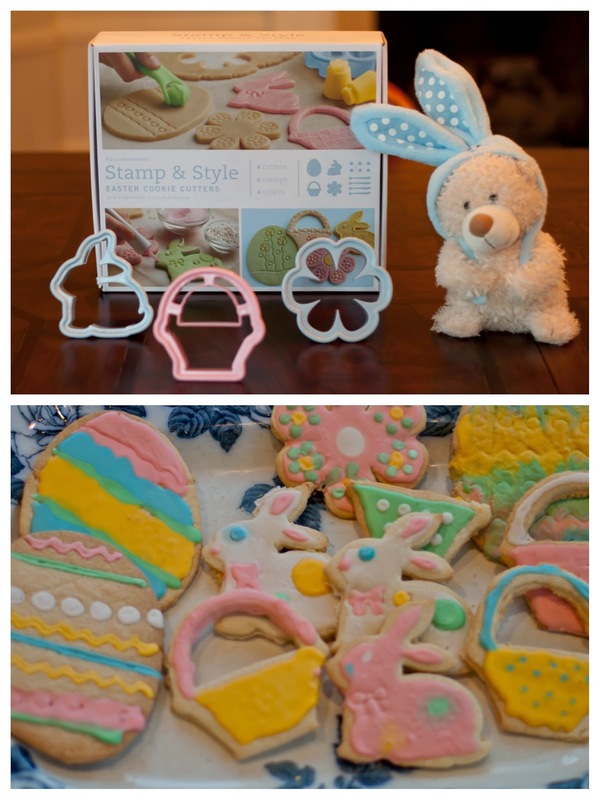 We used Williams Sonoma’s Stamp and Style Easter cookie cutters to create cookies in the shape of eggs, baskets, bunnies and flowers. We decorated the cookies with royal icing. Our go-to sugar cookie recipe comes from Karen’s Cookies (see below for recipe links). Dylan was super excited to create the bunny cake. Trust us, this cake was much easier to make than it looks! Dylan insisted on using an egg cracker to crack the eggs for the batter. This tool is a must have when baking with children. See his demonstration below! We baked our favorite chocolate cake in two 8-inch round pans. Our go-to recipe is Martha Stewart’s Salted Caramel 6-Layer Cake recipe. We made this cake without the caramel and in 2 layers. After the cakes cooled, we used Toba Garret’s decorators’ buttercream icing to frost the middle of the cakes. This site uses referral links. Read our disclosure policy for more information. Next Post Happy National Siblings Day! oh my gosh that cake is so cute I have to try it! the sugar cookies on the other hand… I've never really mastered the art of! The bunny cake and the cookies are amazing looking. I don't think I could do either justice. That is such a cute cake and cookies. I think my niece would like to make the cake with me. OMG soooo cute, going to bookmark this for my upcoming visit to Austin for Easter! Talk about a great way to make sure that Easter is going to be fun for the kids! I love how you celebrated Easter. All the details are perfect. I love the creativity of the cakes! Looks so good and children will love this so much. I really like your cake! Super cute. I’m not at all ready for Easter but I am hoping to prepare a tiny bit ahead of time this year. Sooo cute! 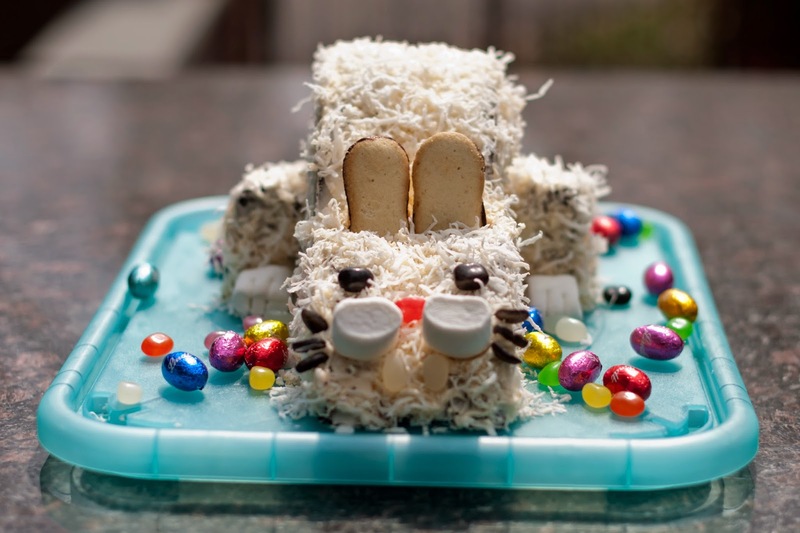 The bunny cake, the cookies like Easter is so much enjoyable by celebrating it with the kids! Easter festivities are so much fun! I really hope the snow melts in time for us to have a Easter egg hunt this year. That party looks like so much funny! The kids surely seem to have had a blast. Such a cute cake.